How is a Man Overboard Alert (MOB) displayed on an AIS receiver when a distress beacon is activated? The AIS-MOB personal beacons make it possible to launch a "Man Overboard" alert and locate the shipwrecked person. The wearing of these beacons is not required by French or international regulations, however, they are widely recommended because they considerably increase the chances of survival when combined with a lifejacket. Distress beacons are now sufficiently miniaturized to be able to keep them on board at all times. AIS beacons have the advantage of being visible from a long distance (5 to 10 nautical miles). The latest ones are also automatically activated and operate for many hours (> 24 hours). They allow searches to be carried out without any constraints related to visual detection. Once the beacon is activated, the man overboard no longer has any manipulation to perform. AIS beacons are individual tracking beacons with an integrated GPS receiver. They transmit an alert and the position of man overboard to nearby vessels equipped with an AIS receiver. SIMY's My-AIS beacon is a personal sea distress beacon. It is pre-programmed at the factory with a unique MMSI number, the first 3 digits of which are "972". All MMSI numbers that start with 972 are interpreted by AIS receivers as "man overboard" distress. In the event of an alert detection, the AIS receiver then indicates a red cross, the GPS coordinates of the shipwrecked person and issues an audible alert. The MOB alert is therefore well regarded as a man overboard distress and not as a nearby vessel (collision alert). Since July 2007, ships over 300 tons have been required to be equipped with AIS transceivers, as well as those carrying passengers. Pleasure craft (AIS Class B) are not required to be equipped with an AIS receiver. However, in recent years, more and more boaters have been installing an AIS receiver on board their boats for their own safety. - Detect man overboard alerts (AIS-MOB). As you will have understood, an AIS beacon associated with an AIS receiver significantly increases on-board safety if you are sailing with several people! 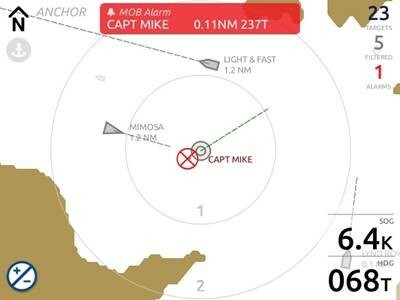 In case of solo navigation, the AIS-MOB beacon will be essential to give you a chance to alert the boats around you. For offshore navigation beyond 60 miles from shore, satellite distress beacons (EPIRB and PLB406) are essential to ensure location if no vessel is within radio range of the AIS-MOB beacon.